The perceptual ’something‘ is always in the middle of something else, it always forms part of a ‚field‘. The cistern at Fort Warden State Park is one of the worlds most unique acoustic sites. It is a circular (cylindrical) cement structure 14′ (4.2m) in height and 200′ (61m) in diameter. Located underground, it sits on top of a hill overlooking the Straight of Juan de Fuca on the Olympic Peninsula in North America. It was originally built to store water for the military installation housing the heavy artillery which was once installed nearby. 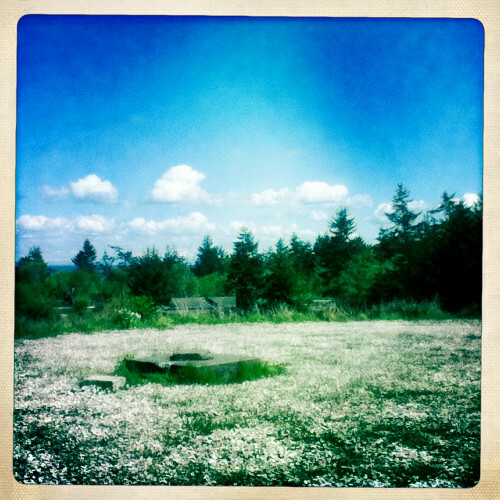 Its an absolutely beautiful location and an entirely unparallelled acoustic experience. The cistern possesses an almost 45 second decay, and since it also has rectangular concrete supports every 12′ (3.6m) there is a wide variety of diffraction, refraction, and reflection phenomena that influence the behavior of sound. Not only does sound generated in the space reverberate, but because of the small square entrance and a small pipe the cistern functions as a large resonator for the entire environment, allowing the voices of passing tourists and the sounds of airplanes overhead into the space. Having done preliminary work during the summer of 2010 and also in the spring of 2011, I returned to the cistern in August of 2012 with material prepared for, and tailored to, the unique acoustics of this place. I learned some things about the space on these first visits and for this third visit I had made a rough calculation of the resonant frequency of the cistern (excluding the concrete posts from the equation) determining it to be about 0.91hz. Higher partials of this frequency were used as the basis for the pieces presented here. Over the next year I used this material to compose a series of pieces focused on different, and specific, phenomena in the space. I wanted to explore, and compose with, the unique acoustic character of the cistern, but not end up with only site specific documents of this rare environment. I feel that the quality of reverberation, and the way in which the space responded in real time to the sounds I placed in it, could not be reproduced with any artificial means. On the contrary, the very circular nature of the cistern can be heard in these three pieces. Sinetone pulses tuned to the 1788th partial of the fundamental occuring at a rate of about 3 pulses per second, slowing down during the piece to a final rate of about 1 per minute. This piece was recorded in real-time and is unedited. 5 plastic tubes of different lengths were made which corresponded to partials 48, 64, 67, 73, and 96 of the fundamental of the cistern. The tubes were played with a tenor saxophone mouthpiece and reed. In the space single pitches were recorded, afterwards these were mixed and combined in a system of overlapping and accumulating sequences. The initial attack of each tone was removed to direct attention towards the behavior of the low frequencies as they decayed. These recordings were then used to construct a piece that moves in and out of audibility, subsuming and being subsumed by the listening environment as it does so. The playback volume should be set in relation to the listening space. Recorded August 2012 in-situ at the cistern, no post processing was applied to the recordings except a small amount of noise reduction and equalization. Mixed, mastered, and composed in Philadelphia and Berlin, 2012 – 2013. Photography by Jean Paul Jenkins and B.E. Gruenrekorder, Nigel Foster, and Lucio Capece. 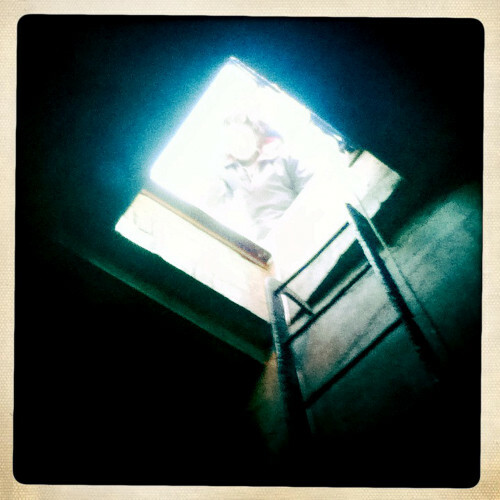 In 2010, Bryan Eubanks started work on a project at the Fort Worden State Park cistern in Port Townsend, Washington. By studying the dynamics of the space — a circular cement structure originally built to store water for military purposes — and exploring it as a unique acoustic site, he began to compose pieces that would show his appreciation of the underground environment and the intricate sound reverberation that the area holds. The individual works that make up Eubanks’s project are separated here across three tracks, which present an insight into the artist’s devoted relationship with a physical construction while allowing his audience to access a rich sonic catalog specific to its location. Eubanks’s respect for the cylindrical cement structure is abundant in the liner notes, where he discusses the exact measurements of the building and the consequence this has on reverberation, decay, diffraction, refraction, and reflection phenomena. He also expands on each composition in detail, which has the potential to isolate the listener from his recordings. The location is apparently manipulated by Eubanks’s own compositional preferences and his sonic palette; whatever he chose to do in the hills overlooking the Straight of Juan de Fuca is going to differ wildly from any other interpreter. The fact that there is zero post-processing and that there are unedited arrangements in real-time makes his aesthetic partiality more significant than it might in any other instance. But instead of creating a barrier, Eubanks opens up a world that would have otherwise remained out of reach; the pace and the organization of these recordings throughout the album are crisp, delicate, and fascinating. This is in part due to the differing nature of each track and the level of patience required to endure its entire length in a single sitting. Although the length does act as an indicator for how cavernous and eerie the space is, the limit to its complexity is seemingly boundless. I tried to envisage myself simultaneously in and out of the structure as a way of absorbing the sound — I was left imagining what the cistern might look like, what the temperature might be, how much light there is, and what it might feel like to emerge on the hills above. All this while dwelling on the concise and almost alien compositions that have been lifted from the site, only to emerge in another form. The variances that occur within the throbbing resonance of “Five Tuned Tubes” provide a sense of character about the space, for example. The way that the pitch heightens at various points and seems to sink at others is amplified at around the 20-minute mark, when the sequences seem to overlap. “Sine Series” even comes with a set of playback instructions, which take into account that the piece “moves in and out of audibility, subsuming and being subsumed by the listening environment.” The 78-minute recording consists of movements in and out of a singular sinetone that wavers in frequency and in volume from beginning to end; even when it sinks into silence to demarcate the groups, its presence can still be felt. The animated pulses that ripple out of sync with the tone are the result of their grouping, which adds to the dimensions of this stunning free-fall drone composition. The sound embodies a level of harshness that conflicts with the openness of “Five Tuned Tubes;” it elaborates on the detail and the curiosity of the space, but also gives it an entirely separate acoustic breadth. These divergences are stark, particularly when compared to the pitch fluctuation on “Pulses.” The latter track is constant and imposing, coming with a stunning degree of intensity that isn’t present anywhere else. Although the high-pitched pulses are what shape the track and its direction, they are counterbalanced with a deep and shuddering bow, which permits a brief moment of calm. Once again, this transforms the listener’s interpretation of the site, where it assumes a place for contemplation, for shelter, for agricultural use, or even for torture. The site dimensions and resulting acoustics allow for such transformations just as much as the arrangement and processing of the recordings do. The structure morphs and changes shape as each movement casts new light on it, and the artist responsible commits to presenting his experiences and his admiration in a cold, naked form. That almost no post-processing was applied only bolsters his determination to exhibit each composition as a mere channel for showcasing the most essential component here: the beauty of the structure itself. 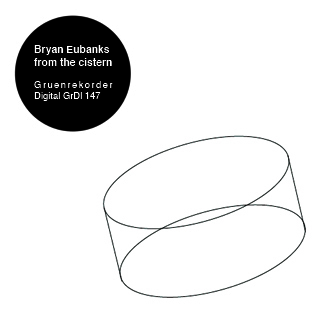 Gruen Digital presents From the Cistern, a new digital album by Bryan Eubanks. Eubanks is a musician composer from the Pacific Northwest in the U.S., but currently based in Berlin. Before diving into the sounds presented on this album, there is an interesting story to the location and environment Eubanks recorded in. The site of recording is the cistern at Fort Warden State Park in North America. This underground structure was originally built to store water for a military installation, but it’s circular cement design makes it a uniquely acoustic environment. As Eubanks notes, the space’s design (with it’s numerous concrete supports) creates a wide array of sound diffraction, refraction, reflection, reverberation, and resonance. From the Cistern is comprised of 3 tracks: 2 pieces that run under 30 minutes and 1 epic piece that runs over 78 minutes. The first track, appropriately titled “Pulses,” consists of sine waves pulsing their way through the nooks and crannies of the cistern. The pulses kind of remind me of elongated sonar pings, steadily droning on. Eubanks slows down the rate of the pulses as the piece progresses at a glacial pace. “Five Tuned Tubes” follows and is a haunting piece that really plays up the resonance and reverberation of the underground structure. On this piece Eubanks employed 5 plastic tubes played with a tenor saxophone mouthpiece and reed. It’s a disturbing piece with long periods quiet (just the perceptible sound of nothingness in the cistern) disrupted by the dense sounds of the tubes reverberating throughout the structure. The final piece entitled “Sine Series,” is namely 78 minutes of layered sine tones generated throughout the cistern. It’s a massive track of layered drones and periodic passages of silence. As opposed to the former piece, “Sine Series” doesn’t sound haunting, but rather uplifting it the use of high-pitched brighter tones. When everything is said and done, From the Cistern is an intriguing and focused effort. I’ll be honest, given the length on the pieces and repetitious nature of the recordings, it did feel like an endurance test at times to make it through the entire album. I think the concept of the album intrigues me much more than some of the sounds presented. That said, From the Cistern is something I’d like to experience in a gallery setting as a sound installation. Wchodzimy do środka ogromnej betonowej cysterny, która znajduje się pod ziemią, a dokładnie na terenie stanu Waszyngton na szczycie wzgórza tuż obok Półwyspu Olympic i Cieśniny Juan de Fuca. Ten obiekt został wybudowany przez wojsko w celu gromadzenia zapasów wody. Amerykański muzyk i kompozytor Bryan Eubanks postanowił zbadać, jak zachowuje się dźwięk w tej wyjątkowej przestrzeni. Jego szczególną uwagę zwróciły zjawiska dyfrakcji, załamania czy odbicia.